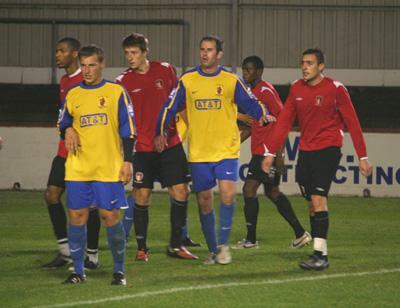 Hayes & Yeading United Manager Garry Haylock opted to give eight players their debut’s in Tuesday evening’s Middlesex Senior Cup tie against Staines that saw the Swans score a somewhat flattering but not undeserved 4-1 victory. It took the visitors just 8 minutes to breech the United defence when a corner from the left was met by a towering header from Gareth Risbridger who looped the ball over Chris Baker into the top corner of the net. United were back on terms eleven minutes later when a right wing cross from Kraig Rochester saw the ball just over Robert Gradwell’s head before being headed past his own keeper by the unfortunate Richard Orlu. The only other real chance of the first half came just after the half hour mark when Marc Cumberbatch blocked a Toby Little shot wide for a corner. The resultant kick was fed back to Little who crossed to Gradwell but his flick header was inches wide of the target. The second half was a little more lively but with so many new faces on both sides it was easy to see why the passing did not flow as you would expect of two of the big three in the County. French striker Franck Padovani went close early on for United after good approach play from Gradwell and Little and the striker was denied minutes later by keeper James Courtnage who held his 20 yard shot. Staines came straight back at United with the impressive left-back Chris Bourne leading the charge as he side-stepped Abdula Nsubuga before trying his luck from 25 yards, just going too high to trouble Baker. Leigh Mason then went close for the visitors before a neat interchange between Elliot Onochie and Michael Kamara saw the latter fire into Baker’s midriff when well placed. Twelve minutes remained when the deadlock was broken. Bourne broke away down the left before picking out Onochie in the centre and the striker did the rest by coolly heading back against the grain into the corner of Baker’s net. Five minutes later we almost had an exact replica as Onochie was again found unmarked in the centre and he again obliged by heading past Baker from close range. 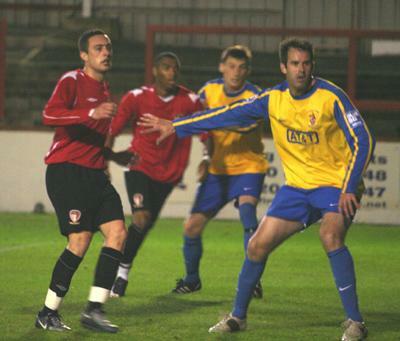 With United now fading, Staines continued to press home their advantage. Onochie sent Mason through but his drive from the edge of the area was pushed over by Baker. Stoppage time had now arrived and a route one punt from the back saw substitute Scott Taylor through on goal, his drive was pushed away by Baker and when the ball was returned to Mason in the area he fired weakly at Baker. The final nail came in the second minute of stoppage time when a free-kick was awarded on the left corner of the area, Onochie stepped up and beat the wall and Baker low into the far corner of the United net.